Do you have a flair for the dramatic? Do you love making up different voices for your stuffed animals or dressing up as a pirate captain and sailing the seven seas? Today’s poetry prompt is all about getting into character. So read on and see if you’ve got the acting chops to pull off a dramatic monologue! 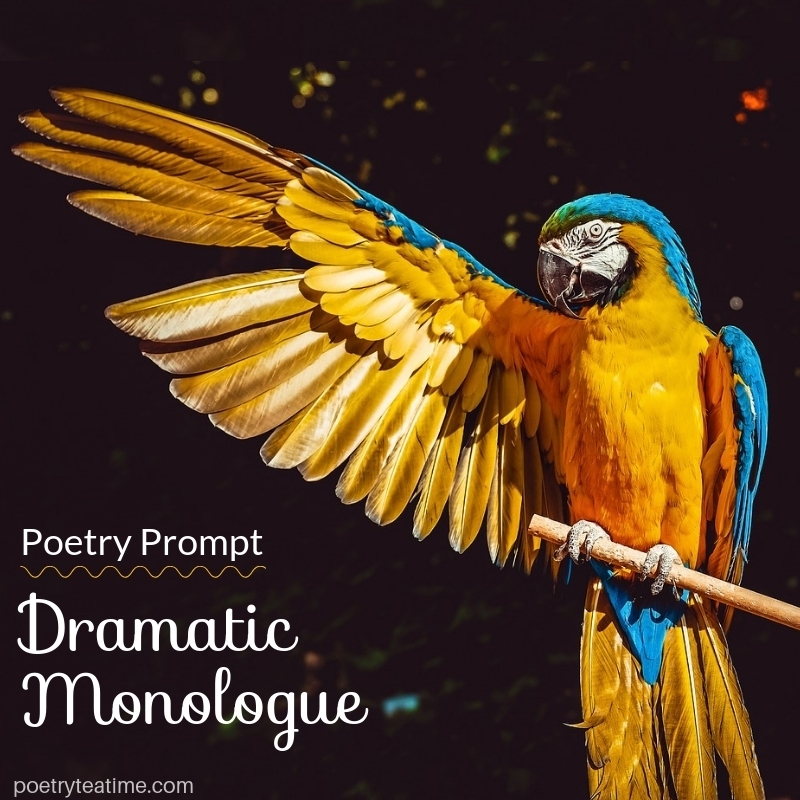 First of all, what is a dramatic monologue? It’s a poem written from the point of view of one person speaking aloud or thinking to themselves. Now, let’s dig into that definition. A monologue means one character is doing the dramatic talking, complaining, sobbing, or evil laughing. Their story can include other characters, but we hear and see everything through that one character’s eyes alone. That means the most important decision you’ll make in writing your dramatic monologue is what character you choose. Are you going to be telling the tale of the flamboyant parrot Penelope? Or maybe Cinderella’s wicked stepsisters need their turn to talk. Your character could be miserable, whining, laughing, or all three and more! The only requirement is that it’s one person’s voice. So take a few minutes to brainstorm your character. What is your character’s name and what are they known for? What do they look like? What’s their most standout feature? What sort of accent do they use? Is their voice deep and slow or fast and breathy? Do they have any dramatic acting quirks, like twitching their eyebrows or clenching their fists? How do they walk? Is it a bit of a shuffle, or a huge fast stride? What do they want most above all things in the world? What are they the angriest about, or what has stopped them from reaching their goals and dreams? Now that you have a sense of your character’s voice and motivations, it’s time to start writing. It may help you to stand up and pace around the room, yelling or whispering sentences that your character might say. The more you can get into the character, the more your poem will start to sound like them! Be sure to record yourself as you pace dramatically so that you can write down your dramatic monologue. Pick and choose the best lines to tell your character’s story. Then, share the monologue with your family at your next Poetry Teatime! You can even create interconnected monologues with your siblings about characters that know each other. If you need more inspiration, some famous dramatic monologues include Alfred, Lord Tennyson’s “Ulysses” and speeches from Shakespeare’s Hamlet and Julius Caesar. Last but not least, share your dramatic monologue with us here!